Dry Fork of Coyote Gulch is one of the most visited canyons of the Escalante, because of three exciting, narrow tributaries - Peekaboo, Spooky and Brimstone Gulches, but the main canyon does have several slot-like sections of its own, which alternate with deep, wider stretches with sheer Navajo sandstone cliffs, patches of bright green shrubbery, sandbanks and pebble beaches - scenery typical of the region, and with generally few people once past the well-known areas. From the Hole-in-the-Rock road to the junction with the larger Coyote Gulch is about 9 miles, and at least two days could be spent exploring the gulch and side canyons. Dry Fork crosses the Hole-in-the-Rock road 24 miles from UT 12, just after the signposted turning to the Early Weed Bench trailhead, and a hike downstream may begin from here. It is more usual though to drive 2 miles further southeast, then a couple of miles along a side track (bearing left twice when it forks) which ends at the rim of a low escarpment close to the gulch. The track is a little bumpy in places but all cars can usually reach the trailhead. The land it crosses is quite flat and some parts of the road have several parallel sets of tracks, as vehicles bypass the inner route when this becomes too rutted. A sign states that camping is not allowed at roads end, but it may be along the approach, and these wide-open spaces are a good place to spend an evening and night - it is agreeable just to sit for a while and the watch the sun set beneath the distant Straight Cliffs and then wait as the whole sky becomes illuminated by stars, with no sign of artificial light. 7 views of Dry Fork of Coyote Gulch. TopoQuest topographic map of Dry Fork of Coyote Gulch. From the parking area at the end of the road, a reasonably well-defined path winds down a steepish cliff face, across a sandy area and along a small ravine into the canyon of Dry Fork. The longest stretch of narrows ends just upstream (west); the gulch here is on average around 2-3 meters wide, deep enough to be in shade for most of the day and apt to be quite muddy with frequent pools up to 2 feet deep after rainfall. This part of the canyon is well-visited and it takes at least 20 minutes to walk through this section, which eventually becomes shallow enough to climb out of. Beyond are some more less deep narrows then a flatter valley continues for a mile or so, meeting the Hole-in-the-Rock road. Just downstream of the entrance point, Dry Fork is joined by the minor tributary of Peekaboo Gulch, then after a few wide bends by the larger Spooky Gulch, which is as far as most visitors travel. Soon after, the main canyon constricts once more and another narrow passage begins, in the middle of which is a large boulder with (usually) a 15 foot drop beyond. This can be climbed on the right side, perhaps aided by a rope as one is sometimes left in place. There are more pools and patches of sticky mud before the canyon opens out again, then a longer side canyon joining from the north leads to the extreme narrows of Brimstone Gulch. 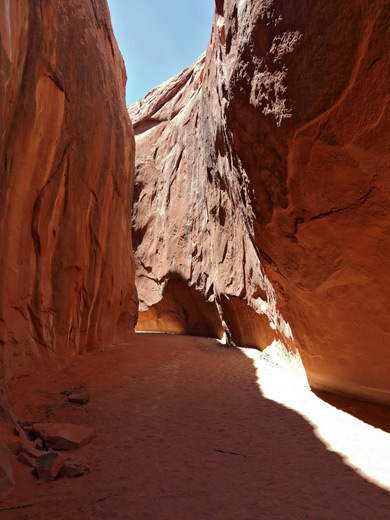 Next is a more open part with some very short, slot-like tributaries, followed by the third main narrow section of Dry Fork - this is quite lengthy, only 3 feet wide at some points, with no obstructions or pools, just a clean sandy floor, straight cliffs at either slide and blue sky above; pleasing, elemental scenery. From here to the Coyote Gulch junction the canyon is wider, often with quite thick vegetation and occasional rainwater pools. 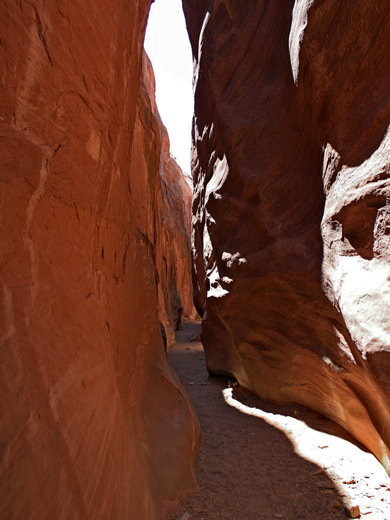 There are several other slot canyon tributaries, on the north side, but all are rather difficult to explore owing to extreme depth and narrowness.